GRAFENWOEHR, Germany — The 2018 Oktoberfest in Munich runs Sept. 22 through Oct. 7 and fest-goers can expect to see stringent security measures again, according to the official website. The heightened security plans include a secured perimeter, a significant police presence with up to 450 security wardens on duty at a time, a multi-language loudspeaker system for crisis communication, standby emergency phones and restrictions on festival entry, according to official news releases. The 100-acre plot of land, nestled in Munich’s central Ludwigsvorstadt-Isarvorstadt district, will be fenced off — including the open area along the Theresienhoehe — to enable 100 percent control of festival access, according Munich police officials. Barriers can be dismantled in seconds for quick escape, however, city officials assured. All backpacks and large bags, or anything with a capacity of more than three liters, are strictly prohibited at the festival, Munich police said. Exceptions may be made on a case-to-case basis for justified reasons, such as support for handicapped people. Small handbags and other belongings will be checked at all entrances, the police said. Other prohibited items include glass bottles, spray cans and any items that can be used as a weapon. Strollers and buggies are allowed, except on Saturdays, German Unity Day on Wed, Oct. 3 and all other days after 6 p.m. Despite tightened security and the general concern of random violence, the two-week Bavarian festival, set to run from Sept. 22 to Oct. 7, is expected to attract large crowds, city officials said, with nearly half a million visitors each day. For your safety, download, print and keep the USAG Bavaria Oktoberfest tri-fold at www.bavaria.army.mil/docs/oktoberfest.pdf. Anything that could be construed as a weapon. An official passport or photo ID. A copy of passport or photo ID, in case it is lost or stolen at the festival. The beer price ranges from 10.70 to 10.90 euros. Be prepared to also pay a server fee, or “Bedienungsgeld,” in some cases. Traditional Bavarian dress “Tracht.” It’s not required, but it is highly encouraged. Your Oktoberfest safety trifold with important numbers. TRANSPORTATION: Driving is not recommended, due to heavy traffic congestion around the city and limited parking. Drivers are encouraged to utilize Park-and-Ride areas or take public transportation. 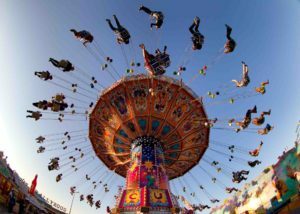 Check out the Wiesn-Barometer to see a schedule of the festival’s busiest days and times. You can also download the official smartphone app for more maps and tips in English and German. The Oktoberfest Service Center: The Service Center, or Servicezentrum, houses the police station, Red Cross, Sichere Wiesn security point for women safety and lost-and-found facility. It is located beside the large Bavarian statue and behind the Schottenhamel tent. POLICE STATION: Open daily. Contact 089-500-3220. RED CROSS: Open daily. Contact 089-502-22424. SICHERE WIESN SECURITY POINT FOR WOMEN: Open daily from 6 p.m. – 1 a.m. and Saturdays from 3 p.m. – 1 a.m. Contact 89-502-22366. LOST-AND-FOUND: Open daily from 1 – 11 p.m. Contact kvr@muenchen.de. Emergency phones with police officers on the other end are located on light poles around the fest grounds. You may have to go directly to the police station for access to an English-speaking police officer. Be aware of pick-pocketing, and keep your personal belongings in secure location. Do not take beer mugs outside Oktoberfest tents. It is a criminal offense, and violators will be forced to pay a heavy fine. Official mugs can be purchased as souvenirs from vendors. Do not stand or dance on tables. Standing on benches is allowed. Avoid disputes. Parties involved in physical fights may be arrested, and use of a beer mug as a weapon is considered “assault with a deadly weapon” by German law. Oktoberfest beer has high alcohol content. One “Mass,” or liter, of traditional Oktoberfest beer has about the same alcohol content as a six-pack of American beers. Do not smoke inside the tents. Smoking is permitted at designated outdoor smoking areas only.